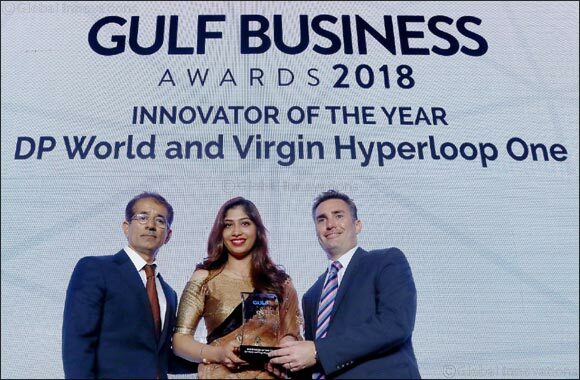 Dubai, United Arab Emirates, 11 September 2018: Global trade enabler DP World has been awarded the Gulf Business Innovator of the Year Award for its collaboration with Virgin Hyperloop One to develop the DP World Cargospeed system that will deliver on-demand freight at the speed of flight and closer to the cost of trucking. The award was received on behalf of the two technology partners by Adnan Al Abbar, Senior Vice President - Planning & Project Management, DP World at gala ceremony hosted by Gulf Business magazine, in the presence of industry leaders, government dignitaries and the media. The award, which is adjudged by an experts panel and a public vote, cites the spirit of collaboration that motivates two global companies that believe in the power of innovation and technology. DP World Cargospeed systems, enabled by Virgin Hyperloop One technology, will transport high-priority, time-sensitive goods including fresh food, medical supplies, electronics, and more. It could expand freight transportation capacity by connecting with existing modes of road, rail and air transport. Hyperloop can achieve top speeds of up to 300 metres/second, making it two to three times faster than high-speed rail. The technology facilitates autonomous operations designed to reduce human errors, run with minimal delays and delivers zero emissions, making it a highly environmentally friendly technology. The Gulf Business Awards is one of the most prestigious ceremonies celebrating the GCC business community. The winners are selected by an expert panel of judges and incorporate a public vote.